Icon is a needed element in the design. A rich free icon library will save a lot. Top 11 best free vector icon sites in 2018 for designers free download. There is an abundance of design resources online, including free vector icons and free fonts. With these resources easily available, there is no reason not to take advantage of them. They will save you a lot of time and give you breathing room before your deadlines. However, every company and project has its own set of unique design specifications. What colors should be used for fonts, buttons, and icons? What should be used - vector icons or bitmaps? Taking all these specs into consideration can make it difficult to find the perfect icon - even with all the resources on hand. Or maybe, especially with the number of resources available. The number of choices can be overwhelming! To help you streamline your process, Mockplus has put together a hand-picked list of the best free vector icon resources. This list will save you time as you search for the perfect vector icon set, no matter what style you’re after. Freepik is one of the largest and most popular platforms for finding free vector icons online. It touts itself as "the leading search engine for free vectors" which is designed to help users find free vector icons, illustrations, icons, PSD, and photos. The site offers a large collection of over 815,100 free and premium carriers. Unlike most other websites, the quality of Freepik vectors is great, and you can download AI, EPS, or SVG formats. FlatIcon has more than 961,000 free vector icons and is known as one of the largest free vector icon databases on the web. Its database contains free icons in PNG, SVG, EPS, PSD, and BASE 64 formats. So, no matter what type of vector icon you are looking for, you can find the resources you need here, including some of the most popular ones. Style free social media icon set. Iconfinder offers 2,592,445 SVG icons to date and is undoubtedly one of the top free icon search engines. Here, you can find free patterns suitable for a variety of design colors. It is important to note, though, that while there are many icon libraries, they may not meet your exact needs, so you may have to edit the icons yourself. The Iconfinder Icon Editor is a new feature of Iconfinder. It is a free and easy-to-use online icon editing tool. You don't need to download or install software - you can use it via a browser. It is very simple to adjust the color, size, or text of the icon. Even if you don't have vector editing software, you can definitely meet the most basic icon editing needs with the Icon Editor. Icons8 has 74,600 icons, covering various styles including those for Android, iOS, and Windows. There is no need to connect to the network to download. You simply need to select an icon and drag it to your preferred editor. You may even directly change the icon color and size without logging in (except for png256 and png512, which require login to access). Icons8 supports PNG, SVG, PDF, and EPS. Icon Ninja is a search engine that supports nearly 1 million free icon materials. It supports keyword search. All materials provide detailed information such as format, width, height, file size, etc., which make them very suitable for front-end engineers or PPT designers to use. The materials are available in PNG and SVG. Vector Me is a popular site for finding free vectors, logos, patterns, and clipart. The site contains a collection of over 280,000 vector icons. You can use these files for free, but you need to provide attribution. Vector4Free's collection is not huge - just over 1,500 free vector elements and icons, but the quality is good, and everything is well-marked so it's easy to find what you want. All featured vector images are free for personal use, but check the fine print before using them for commercial purposes. Vecteezy is an index site with a lot of free vector graphics. It collects a good number of picture material and is updated every day. Some of the vector graphics are shared by other designers, and most of the material can be downloaded for free - except those which are marked green and labeled “Premium”. Vecteezy has an icon editor, so you can edit icon colors, fonts, sizes, etc. before downloading. Vexels is the design stock where everyone can find whatever they need. They've got thousands of colorful and handy icon graphics and designs for free and commercial use. The Noun Project aims to create a media library that includes free-to-use HD symbol icons. Designers from all over the world submit new works every day, so the collection has increased significantly since the project’s implementation. It's important to note that the format provided by The Noun Project is SVG, so you must use it with tools like Adobe Illustrator or CorelDraw. As the world's largest designer sharing platform, Dribbble gets updated with high-quality design works every day. Naturally, this includes many high-quality free vector icon resources. With the right keyword search, you will stumble upon nice surprises. At present, many vector icon resources need to be combined with tools such as Adobe Illustrator or CorelDraw. This raises a critical question: How do you use these high-quality icon resources at the beginning of the design process? The answer? You need a prototyping tool that supports SVG icon import. 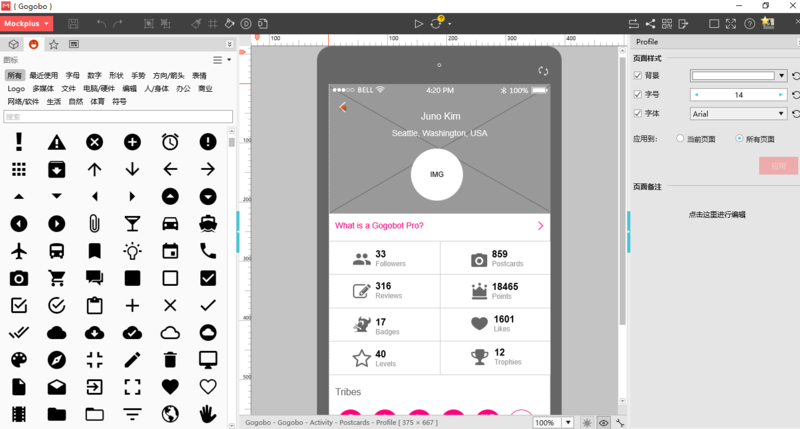 One such prototyping tool is Mockplus. It has extensive built-in free vector icon resources, which can be used as an icon library. Its 2600+ vector icon collection is more than sufficient for general projects. If you need other styles of vector icons, you can import external icons via the built-in SVG component. These are the best free vector icon resources we want to share with you today. We hope they’ll make your workflow smoother and shorten your design process without compromising quality.